The Arabs were responsible for the popular reintroduction of Alchemy into medieval Europe. Jabir Ibn el-Hayyan, known as Geber in the West “has been acknowledged by both the Arab and European alchemists as the patron of the art since the eighth century.” Dr. M. Aldrich has commented that “skilled alchemists with pretty classy lab equipment experimented with all kinds of po­tions; if Geber and others could distill alcohol, they could have made hashish (or even hash oil), and, indeed, Geber included banj among his powerful prescriptions. An amusing tale of a hypocritical priest, from Arabian manuscripts dated about CE 950, shows that use of banj was secret and spread among religious persons who professed against it.” A number of Sufi s can be tied to both hashish use and the alchemical language, most notably the Arabian Alchemist Avicenna (known in Arabic as Ibn Sina), Mansur el-Hallaj, and Farduddin Attar, the Chemist. In what can be considered more than a mere coincidence, we find this same figure playing a highly regarded role in medieval alchemy . Alchemists like Paracelsus and Eirenaeus Philalethes mention the name Elias, which in the authorized version of the Bible is the same as Elijah, the powerful magician-prophet of Tishpeh, whom the Sufi s equated with Khidr , the green man and patron saint of cannabis. Idries Shah claims that Paracelsus and other medieval European alchemist like Roger Bacon, Raymund Lully and Henry Cornelius Agrippa, were transmitting Sufi knowledge in the West, acting as scouts for the Arab dervishes and their system of attainment. Expulsion of the Demons, an anonymous engraving from the 1600s, is another classic example of alchemical initiation hidden behind the facade of chruchly pursuits. In the foreground an alchemist (wearing a small Phygyric initiation cap) cheerfully slides an associate head first into a large athanor (alchemical oven) where the “demons” are baked out of his head into a billowing cloud containing the universal elements in an expanding consciousness. The one who is baked holds his hand up as if to say to the other, “hold steady, right there brother.” Two mushroom s joined at the cap appear in the lower left of his expanding mind-cloud. In the left foreground incense is vaporizing from a bowl set on flaming coals in a squat pan on a tripod. Directly above it a “bishop” is pouring an alchemical substance down the throat of a seated initiate who is steadying the bishop’s arm that is holding a funnel in the initiate’s mouth. Supernatural arms extend from his seat and grasp a pan below. Shelves of alchemical medicines are behind them. To the right of the medicines is an alchemical still. A large mortar and pestle is on a stand in the center of the engraving. The alchemists prepared sacraments to investigate the mysterious murkiness (in the pan) below, others that could blow your mind in the brilliance above. Balance was to be achieved between the extremes. It is represented by the mortar and pestle in the center. The two opposites must be meticulously ground together until they become one. There is a wealth of documents indicating medieval alchemists were experimenting with methods to transmute base metals into gold. Most of the alchemical manuscripts detail laboratory operations while discussing philosophical and transcendent mysti­cal states. Written accounts by credible witnesses to transmutations record that some of them were indeed successful. This Philosopher’s Stone or Universal Elixir was an alchemical preparation made from the mineral kingdom. The Medieval philoso­phers claimed that when properly prepared the mineral stone could transmute base metals into gold; in minute dilutions it could end sickness and retard aging indefinitely, transmuting the human organism into an immortal being. In what indicates a continuity of traditions, like the Hindu and Chinese alchemists’ sacred elixir of immortality, the adepts claimed that when taken in a minute dose, this substance would cause the inbiber’s hair and teeth to fall out, later new hair and teeth grow in and the successful alchemist became immortal. Unfortunately many pseudo-alchemists, called “sloppers,” are known to have perished while experimenting with these powerful concoctions. A much safer path was the preparation of the Vegetable Stone. 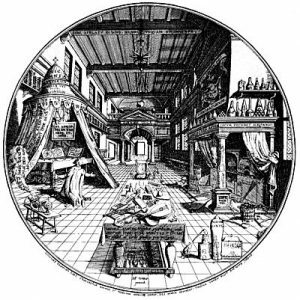 The term alchemy was applied to a wide variety of different schools of thought, dealing with philosophy, physics, chemistry, unlocking the healing virtue in plants, and countless other subjects. In short being an alchemist was many different things to many different people and many medieval alchemists pursued the Philosopher’s Stone as shaman mystics, psychoanalysts, herbalist apothecaries, metallurgists and cabalists all in one, in an attempt to find the very essence of creation. Khunrath is telling the reader that his words are Cabalistic, or in cant: esoteric meaning is hidden in his prose, analogical artwork and the slang of the day. In his day using marijuana for religious purposes was still considered diabolic and severely prohibited. One could still be dragged before the Inquisition accused of committing satanic rites, tortured into confessions leading ultimately to death and forfeiture of all properties. His warning to work alone and beware of impious as­sistants is always good advice — the profane naturally obstruct spiritual exploration. However, such advice is imperative for survival if your religious sacraments and spiritual explorations are prohibited by the dominant orthodox paradigm controlling the state: beware of those with whom you would share the “especial Secret Divine Vision” for they may foolishly reveal incriminating evidence or worse, be informants working for the Inquisition that would turn you in for a percentage of the forfeiture (finder’s fee) profits from the seizure of your personal property. The Medieval alchemists communicated with one another through their writings. It was too dangerous for them to work together in communal laboratories, and by their independence from each other they were less vulnerable to attack from the prohibitionist Christian theocracy. They also communicated with one another across time through their writings. In Khunrath ’s time hemp was a ubiquitous crop; its fiber was essential to global economic trade, for the sails of the world mer­chant fleets could be made from hemp fiber only—no other vegetable fiber sail cloth could endure the stresses of wind and salt air on long ocean voyages. Paradoxically, using hemp flowers as a religious sacrament was prohibited yet fields of hemp flowers could be found nearly everywhere. The European hemp flowers routinely produce about one or two percent THC isomers (Tetra-Hydro-Canabinol considered the psychoactive carbo­hydrate family of molecules in cannabis), whereas the resinous red hashish of Lebanon is about ten times more potent. Khunrath praised the “red resin of the wise,” calling it the transforming substance. The salamander is a curious symbol in alchemy illustrated in many famous alchemical texts including the Book of Lambspring. The key that unlocked one aspect of its esoteric symbolism was found in a fourteenth century painting from an alchemical text showing a man intoxicated on Amanita muscaria mushrooms. He clutches one mushroom in his hand as he dances about holding his other hand to his forehead as if the reve­lation is too intense. Behind him a tree grows with a spotted mushroom for a top. A salamander or lizard floats upward parallel to the Amanita tree. Next to it another salamander roasts upon the fire in much the same way as the philosopher in the Book of Lambspring roasts a salamander on a fork in a fire. Perhaps five hundred years ago psychonauts called such a psychedelic trip “roasting a salamander .” And just as today where psychonauts in quest of knowledge often utilize marijuana and psychedelic mushrooms for similar purposes, so too perhaps our Medieval ancestors burned incense and roasted salamanders in order to achieve illumination. Interestingly as was mentioned earlier, Rabelais refers to the good Fly Agaric mushroom twice in Gargantua and Pantagruel. 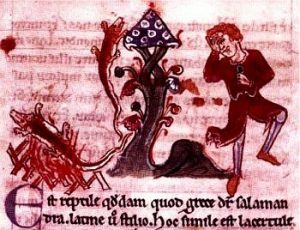 In the chapter mentioned earlier in which Rabelais comments that “a certain kind of Pantagreulion is of that Nature that Fire is not able to consume it,” is a paragraph that refers to the alchemical salamander as well as a mysterious tree that is of “a very marvelous nature” and “produceth out of its root the good Agaric.” Rabelais also burned cannabis incense , like Khunrath a century later. Rabelais was familiar with the writings of Zoroaster and he translated the works of the Roman historian Herodotus, who recorded an early account of the Scythian marijuana smoke baths. In light of this, it is not at all surprising to find the name of Zoroaster , who attained ecstasy through hemp , mentioned in many of the old alchemical texts. Nor should it be surprising to find the system of self initiation promoted by earlier Zoroastrian influenced Gnostic alchemists, like Zosimos, continued on in secret throughout the Middle Ages. We get the modern term “gibberish”, from Geber’s name, and the complicated and cryptic alchemical papers associated with him. Idries Shah, The Sufis (1964). Dr. M. Aldrich, Cannabis and Its Derivatives. Martin Luther and Paracelsus were contemporaries; Luther was ten years older than Paracelsus. During Paracelsus’ lifetime Luther and his band of Protestants were an oppressed minority and the Reformation had little effect on the “bombast” of Paracelsus. Strangely Shah makes no direct mention of the Sufis rich history with hashish, although he does comment that the medieval witches picked up their use of powerful hallucinogenic plant drugs like thorn apple (Datura stramonium), and mandrakes from an earlier dervish influence. We should however make it clear that Alchemy was a synthesis of many philosophical and protoscientific systems and techniques. There were alchemists who dealt with the metamorphic relationship between energy and matter. They worked to produce a universal elixir from the mineral kingdom and were especially fond of the clan of metals. This universal elixir from the mineral kingdom could transmute any of the base metals into gold. That was proof that the alchemist had indeed made the true mineral Stone capable of initiating a metamorphosis in a human that lead to transcendent illumination and immortality. The fourteenth century adept Nicolas Flamel is the most celebrated of the gold making alchemists. He was a poor scribe that began his career working in a rented booth only thirty inches square in the rue des Ecrivains, Paris, opposite the Church of St. Jacques-la-Boucherie. There he copied manuscripts for a commission. After he and his wife Perronelle succeeded in making the mineral stone, the Flamels “began to endow chapels. churches, cemeteries, charnel-houses and hospitals all over the city, the deeds for which, according to constantly-quoted French archivists, still exist.” (Johnson, The Fulcanelli Phenomenon, p. 88) Flamel could not have been such a renown philanthropist on a meager scribe’s wages. And like music legends of the twentieth century, Elvis Presley and Jim Morrison, the death of the Flamels was said to have been staged so they could erase their personal history. In their case, because they were not aging like the vast majority of Parisian urbanites in the 1300s. Hienrich Khunrath, (1560-1605) Amphitheatrum Sapientiae Aeternae Christiano-Kabalisticum, (Hanau, 1609; French edition, 1899), translated by Emile Grillot De Givry in Picture Museum of Sorcery Magic and Alchemy, 1929; (English publication, 1963). Hienrich Khunrath, Von hylealischen Chaos, from Psychology and Alchemy, C.G. Jung (1953); Princeton University Press, 1968. Jung remarked the Tabernaemontanus does mention that a plant whose identity is obscured was “a cure for epilepsy and melancholic fantasies, makes sleepy and drunken like wine, is used in love-potions.”— Mysterium Coniuctionis page, 133. Mysterium Coniunctionis, pages 134, 135. Quoted in Psychology and Alchemy, page 460. Originally published in 1625 as one of 22 alchemical treatise collected in The Hermetic Museum. As quoted in Le Mystere Des Cathederales, Fulcanelli.